I love the Polycount community. Please feel free to critique if you like. But beware, if you make me cry, I will haunt you in your sleep. This is also for my personal journalizing as well to show you guys my progression. 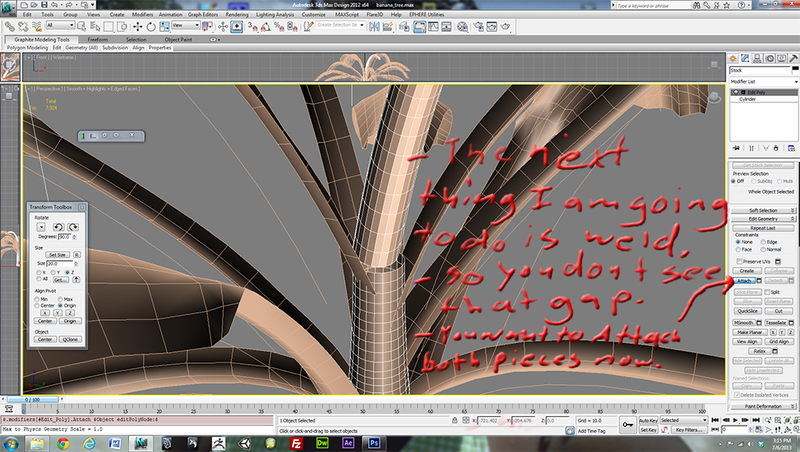 Thanks so much for this Thread Polycount. Time to get serious. To start it off I thought I would post a couple of models I posted in the What are you working on thread. First being my LP Winchester Rifle Created with Maya. 1,860 tri's and 3 1024x1024 textures. Diffuse, Spec, and Normal. Worked on this a few months back. Hi, just posting a quick concept of my next model. 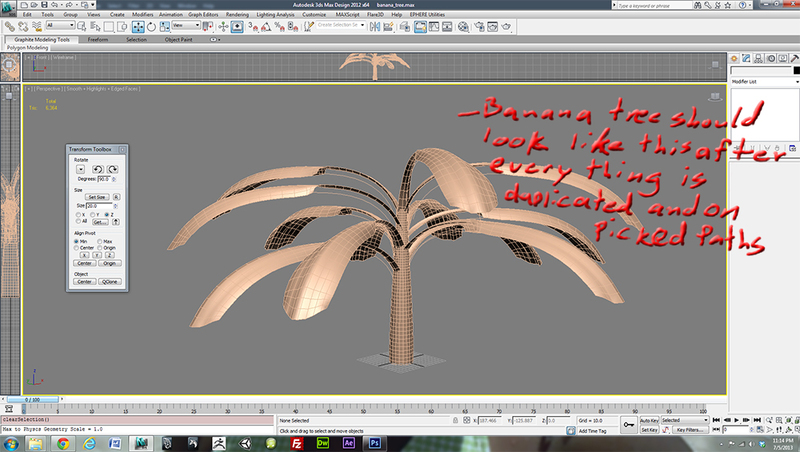 It is a concept I drew of a banana tree. 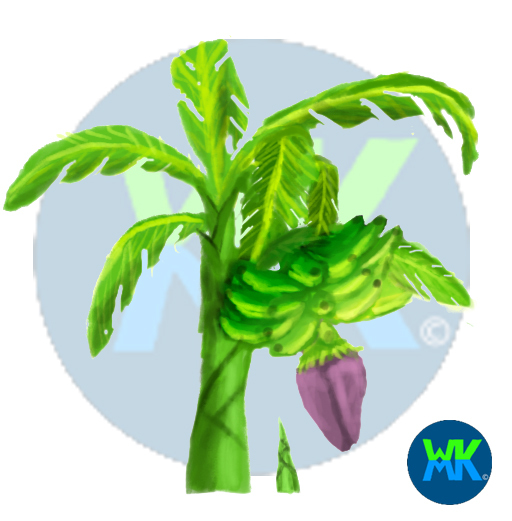 I want to make it stylized with painted textures and looking to model it stylized exagerating proportions of the bananas and flower to show its a banana tree in game. I am going to start off with the stock and maybe instance two leaves and save the bananas and flower last. Will bring into Mudbox. and work with 3DSMax for its low poly version Baking Normal, Spec, and Ambient Occlusion. This one is going to be fun. timing myself hoping to finish this before this weekend. 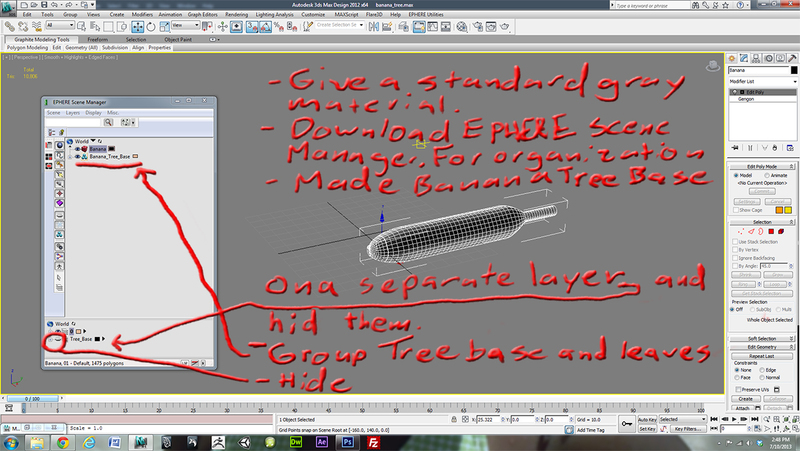 Hi guys decided to post a tutorial on how I am going to go about making my banana tree. Took me a while to figure out a workflow. But I got it now. 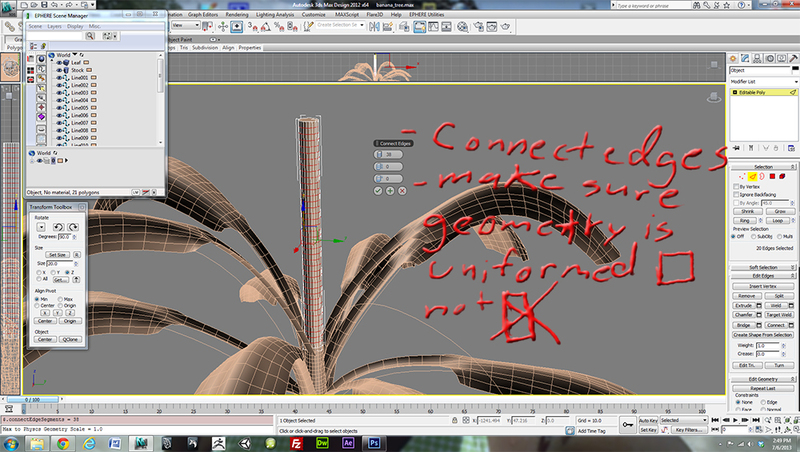 With this I am starting to make a Base Mesh preparing it for Mudbox. Start by using your concept to understand scale and proportion. 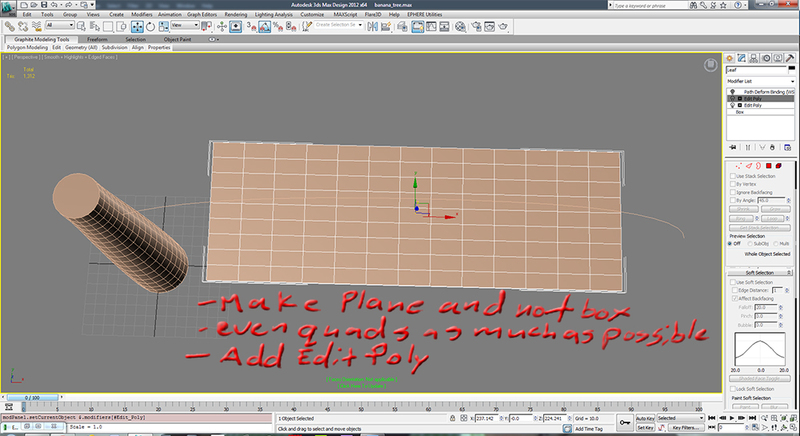 On this first step I want evenly spaced quads for Mudbox to Subdivide properly. The second part I added more divisions for somewhat even quads by adding an Edit Poly modifier on it. Chose top verts, used soft selection and pushed the fall off till it reach the bottom of base. 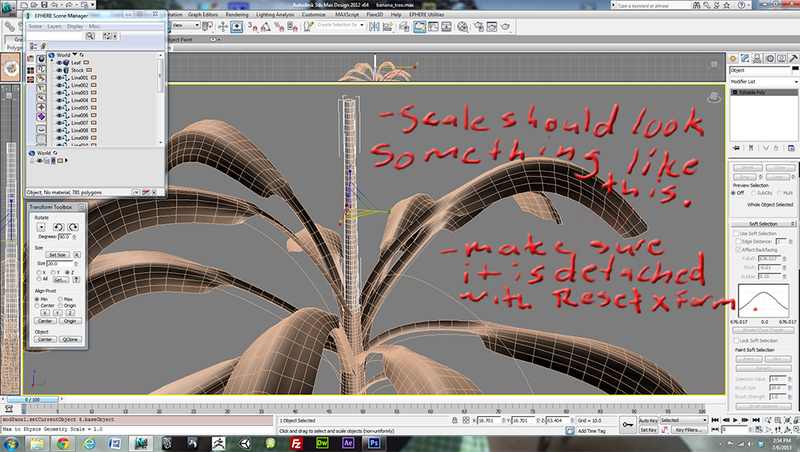 Scaled on X and Y to create base stock of banana tree. Third Part I made a plane for the banana leaf. (I made a box but turned it into a plane on accident don't know what I was thinking.) Added an Edit Poly after I got enough quads in. 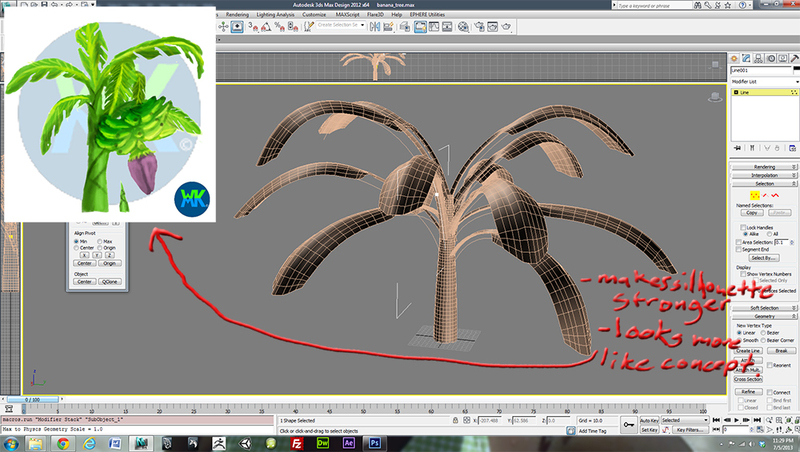 For the fourth step, I compared and looked at concept image and ref images of banana leafs as well. 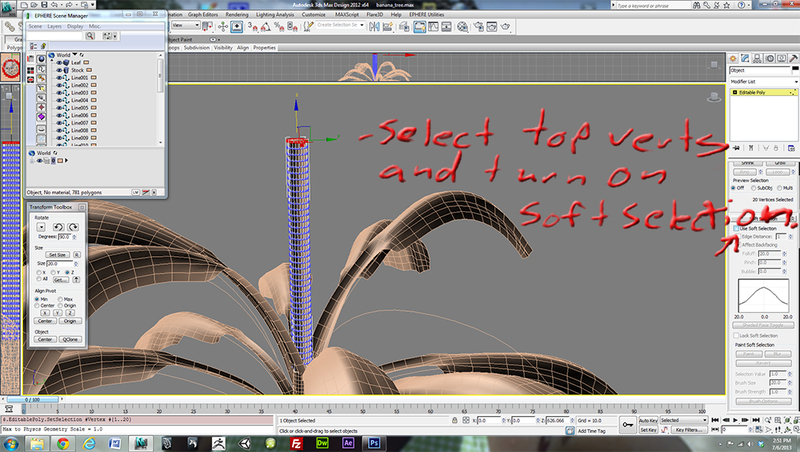 I started scaling vert's to form leaf and pulled up the center because stem holds up leaf as it hangs over. 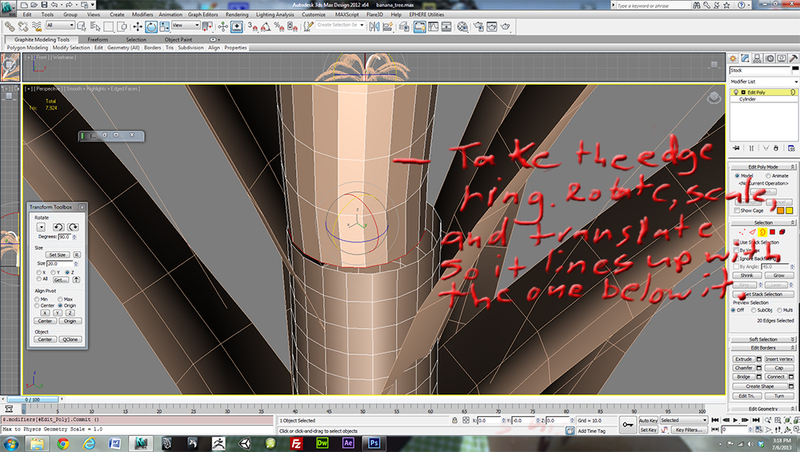 Extruded bottom four edges to create branch. 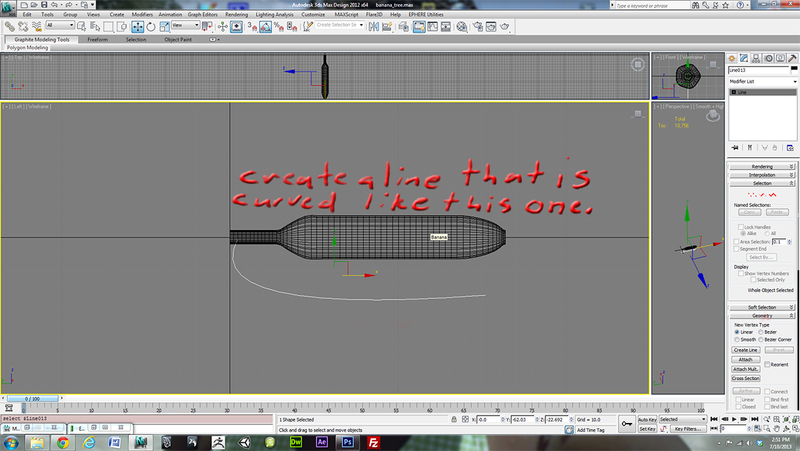 Step 5, I created a line in Front view and selected corner to smooth as drag type. Created the arch you see next to my base of banana tree. I adjusted verts if needed. This is to have the Leaf follow the line. 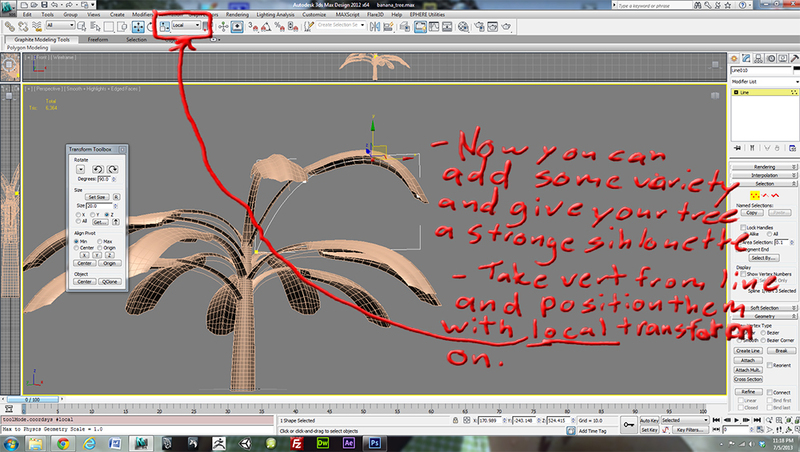 Step 6, If not already line up the line with the Banana tree base. 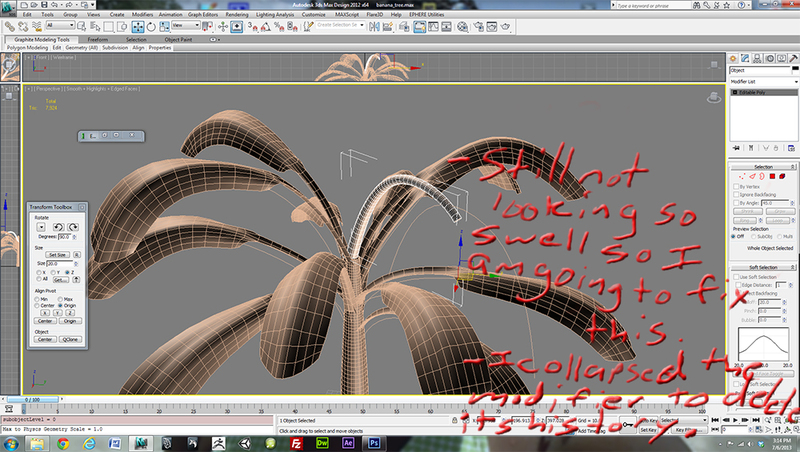 I added a Path Deform Binding (WSM) World Space Modifier to the Leaf. 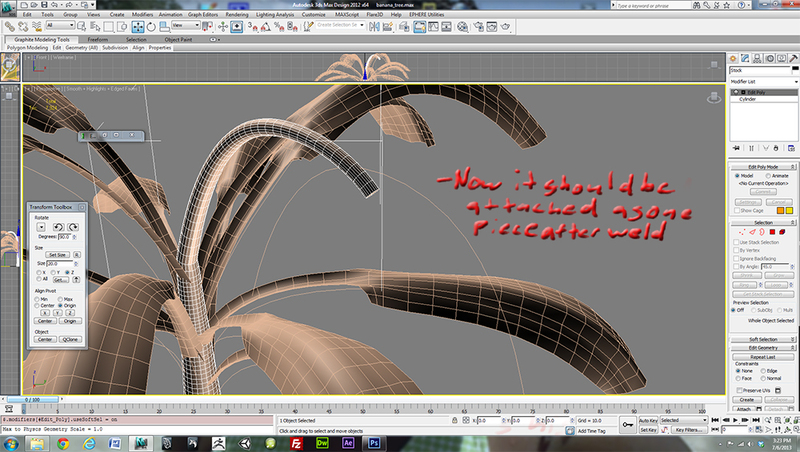 I do not know how many times I have done this but don't add just a Path Deform to it in the Modifier Stack. It wont work. Heads up. 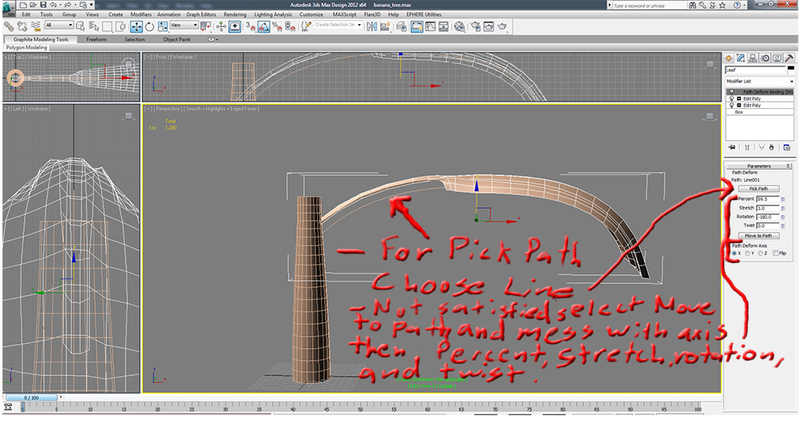 Step 7, For pick path choose the line. Press Move to Path Button. Mess with Rotation axis to line up leaf. If it is upside down. Rotate 180 degrees with values under rotate. Line up with Percent. Stretch and twist if need be to add some character. 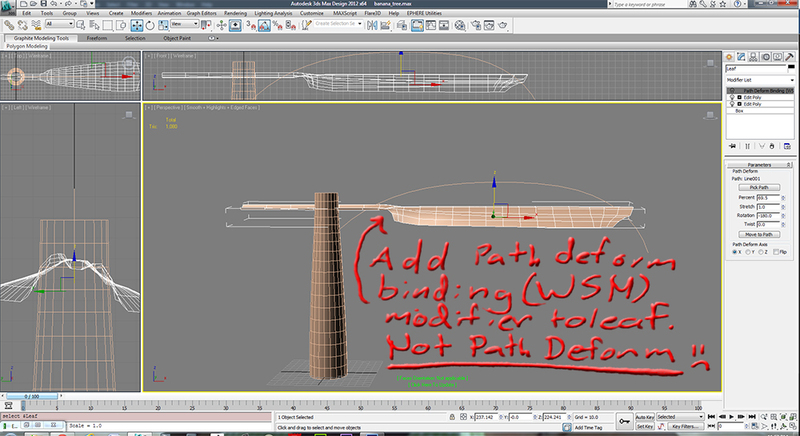 Step 8, When finish adjusting Path Deform Binding (WSM) Look at ref and compare with concept. Looking good so far. Stay tuned for tomorrow's progress. Here is the completed animated Gif for the first 8 steps. Continuing on 2 o'clock in the morning. Why am I doing this. Because I love it. But here we go. 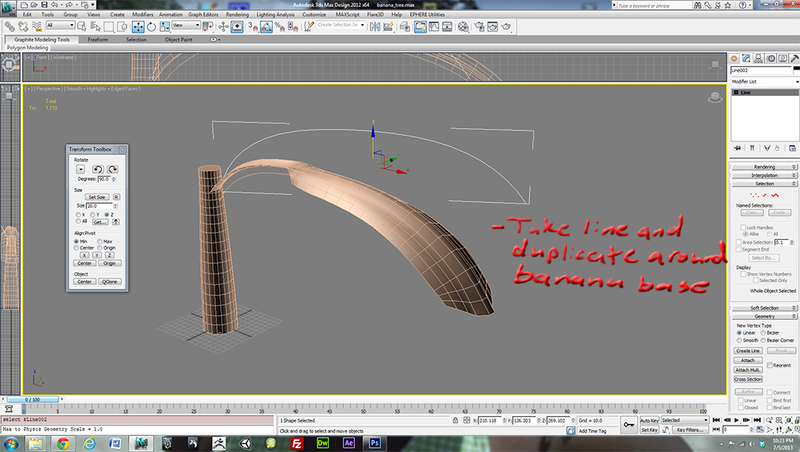 Step 9, Take the Line and duplicate around the base of the banana up and down. Step 10, After rearranging lines. Looks like little hairs sticking out the sides. 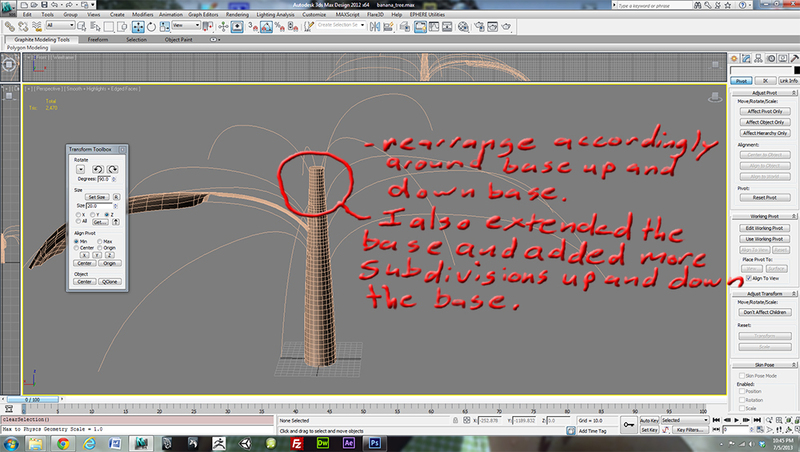 You might need to extend the base a little bit and make it taller and add more subdivisions. Rearrange your lines some more if base is not tall already. 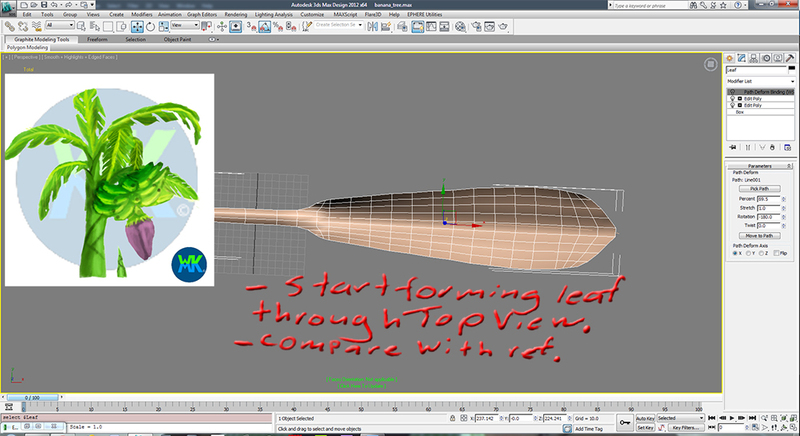 Step 11, Hold shift to duplicate the banana leaf as a copy not an instance. The next thing you want to do is choose Pick Path and choose your line. Click Move to Path. Adjust Path Deform axis if need be. Do this with all of the rest of the banana leafs until they line up correctly. 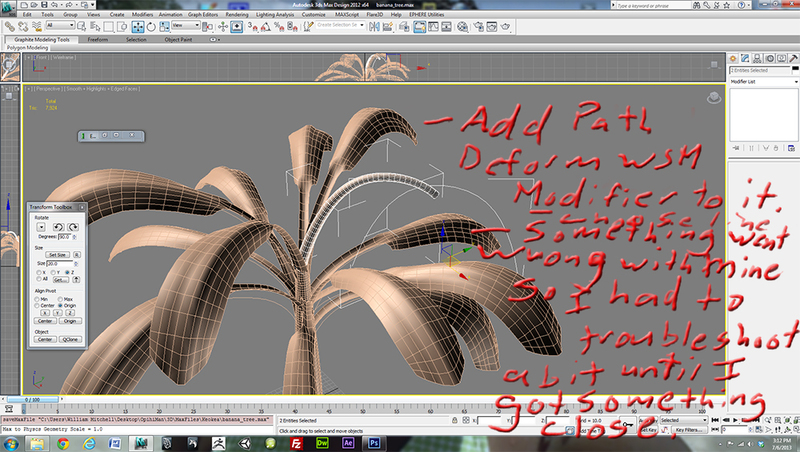 Step 12, Banana tree should look like this after everything is duplicated and on picked paths. Looking pretty awesome!!! Step 13, Now you can add some variety and give your tree a strong silhouette. Take verts from lines and position them to your liking with local transform on. 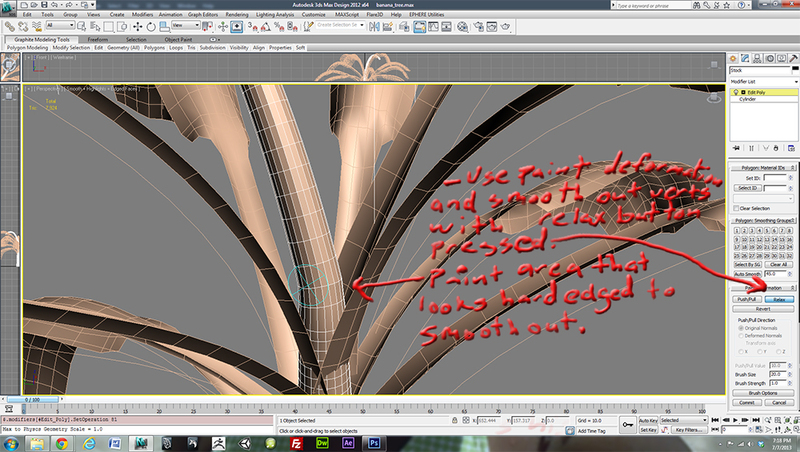 step 14, The tree is starting to look much more like its concept. Pretty cool. The silhouette reads better with all of that variance. Keep on truckin. 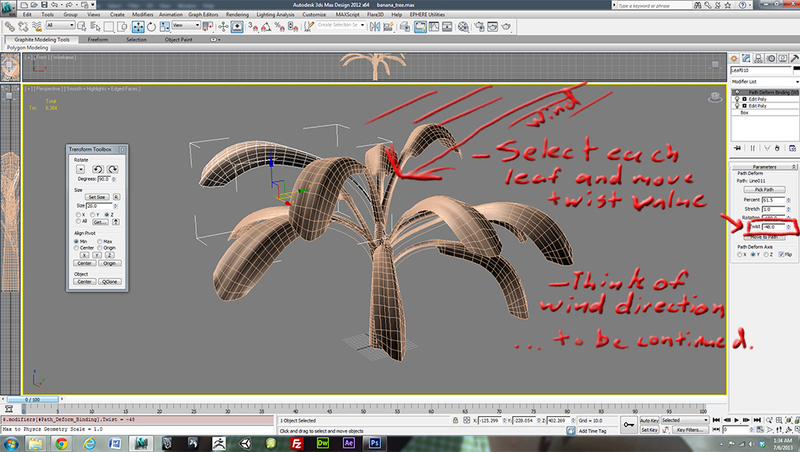 Step 15, Select each leaf and move its twist value. Think of wind direction. Hope the illustration helps. Looking good now. 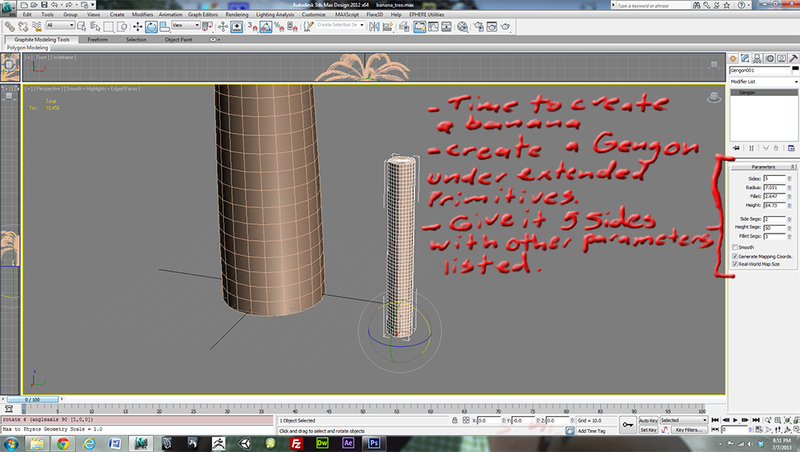 Will continue on with the Base Mesh for the Banana stalk tomorrow. I mean later today. Progression continues. Here is the animated gif for the next 7 steps. Okay, This has taken me longer than expected guys. Sorry about the wait. Almost finished with the base Mesh. Still got to show you guys Mudbox and how to bake on a low poly version. Will make sure I can get this done soon so I can show you guys my workflow. 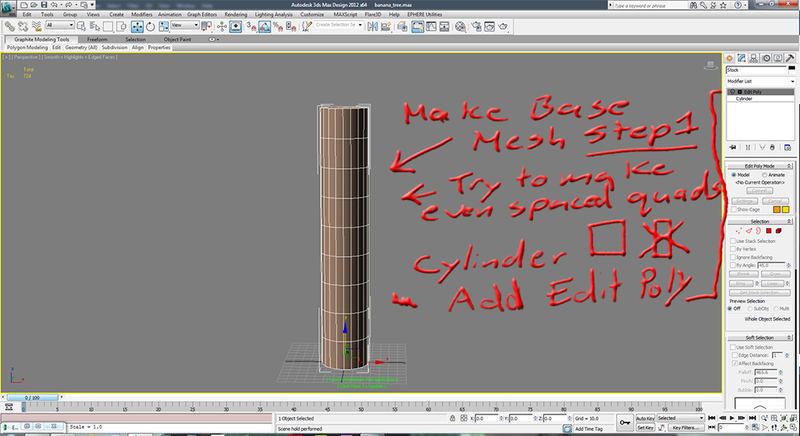 Here we are step 16, I extruded the top of the base and duplicated a line. After the extrusion I Detached. Once I did that I went to the far right modifier tab with the hammer and I hit reset XForm. I then collapsed the modifier stack to erase history. Select the edges and Connect option box. Add lots of subdivisions. Step 18, Connect Edges and make sure your geometry is uniformed. 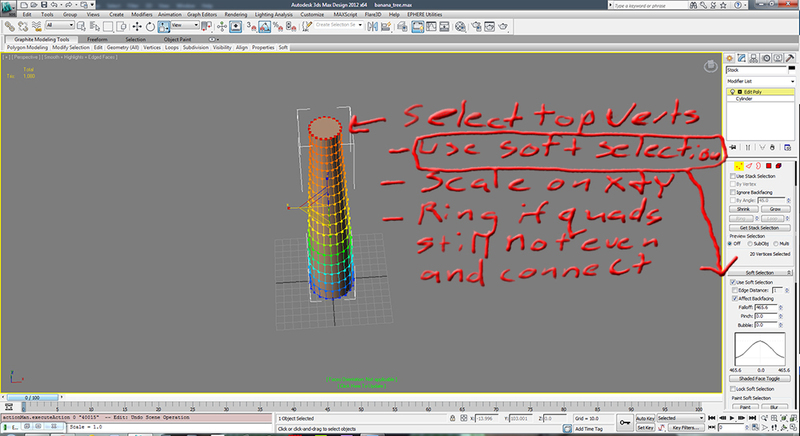 Step 19, Select the top verts and turn on soft selection. 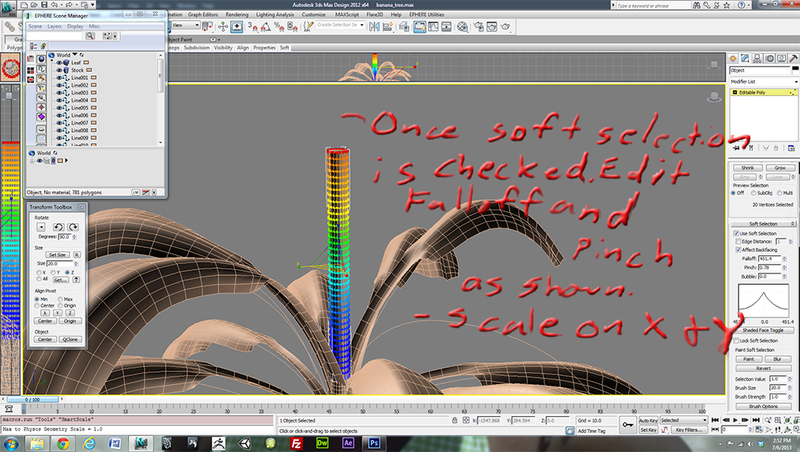 Step 20, once soft selection is checked edit falloff and pinch as shown. Scale on X and Y. 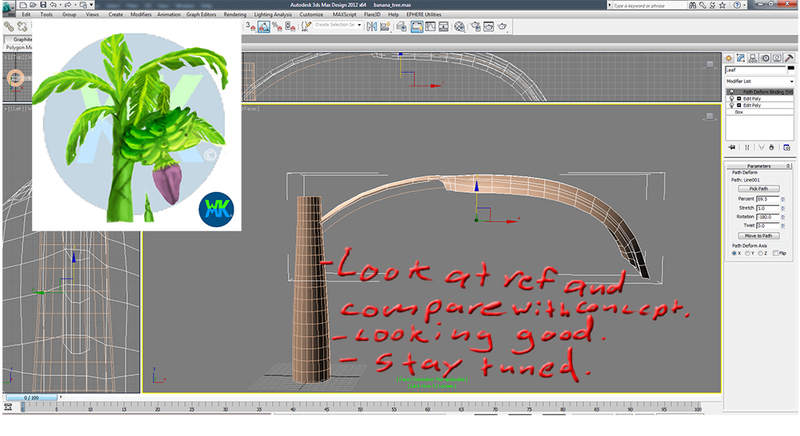 Step 21, it should look like the picture shown. 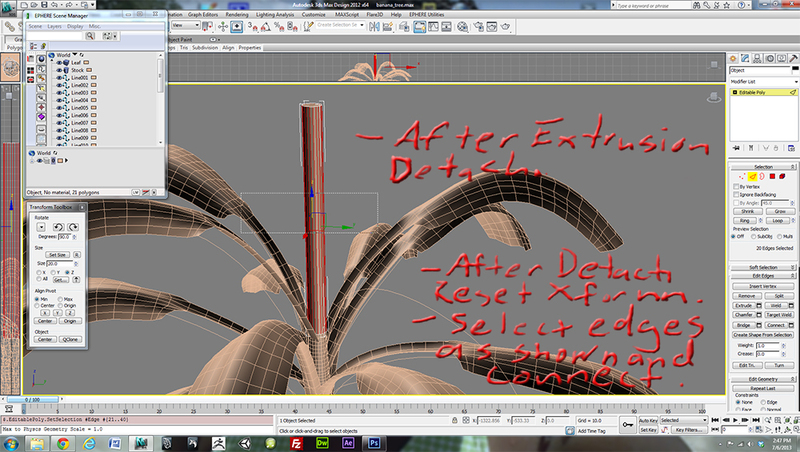 Make sure it is detached with Reset XForm located under the modifier tab with the hammer on it. Select object and press Reset XForm button. Then collapse your modifier stack. Step 22, Add a Path Deform WSM to it. Pick Path and choose line. Something went wrong with mine so I had to troubleshoot and come up with something close by adjusting the settings. Step 23, still not looking swell at all so I had to fix it. I just collapsed everything and deleted its history once it was at this state. Step 24, The next thing I went ahead and thought of was I needed to weld this off gap because my Path Deform did not work so great this time. Attach both pieces of the banana stalk and the stem you seen shown. 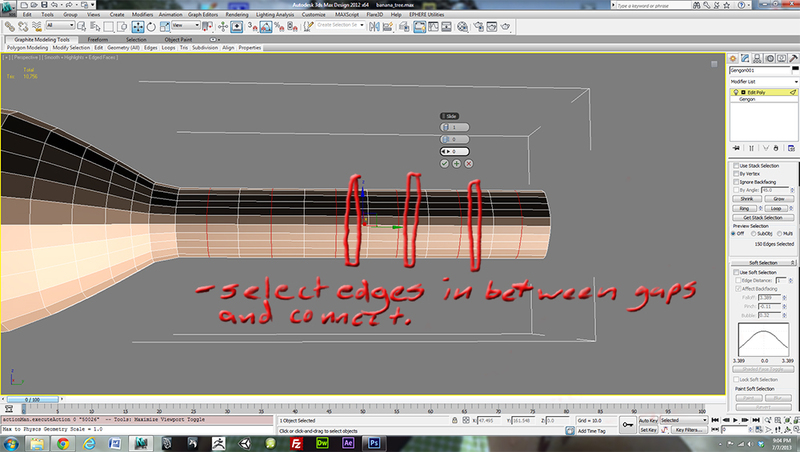 Step 25, Take the top edge ring, rotate, translate, and scale until it lines up evenly with the bottom edge ring. 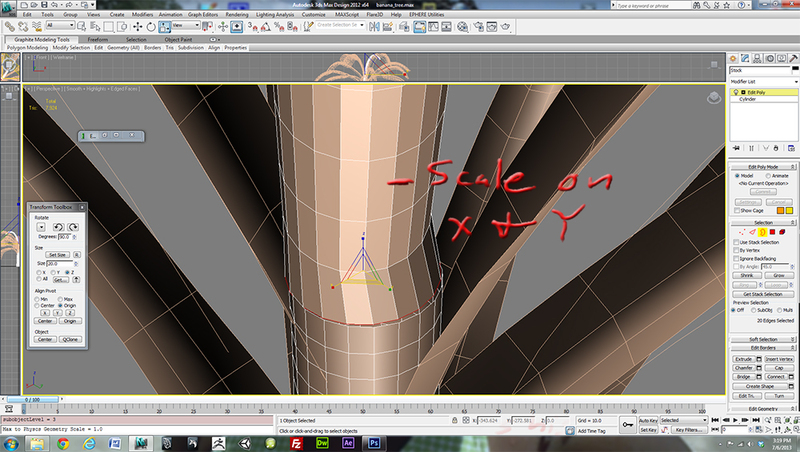 Step 26 of the base mesh, I scaled on X and Y to line it up pretty closely. Step 27, Use the weld option Box. Weld until all seams are closed. Stpe 28, Now the banana base should look as one piece after the weld. Step 29, as it left a hard edge after the weld. I used paint deformation and smoothed out the verts with the relax button pressed. Just paint the area that looks hard edged to smooth it out. 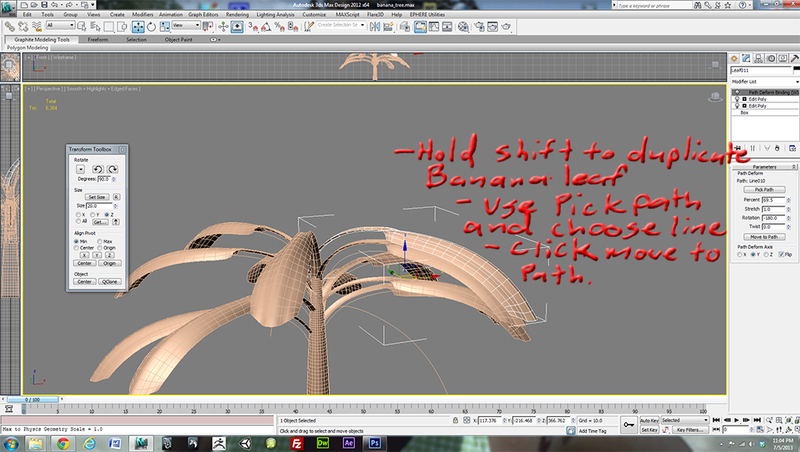 Now its time to create the banana after troubleshooting that one. Create a Gengon under the Extended Primitives roll down with the parameters shown and make sure it has five sides that are smoothed by adjusting the fillet. Yay!!! banana time!!! 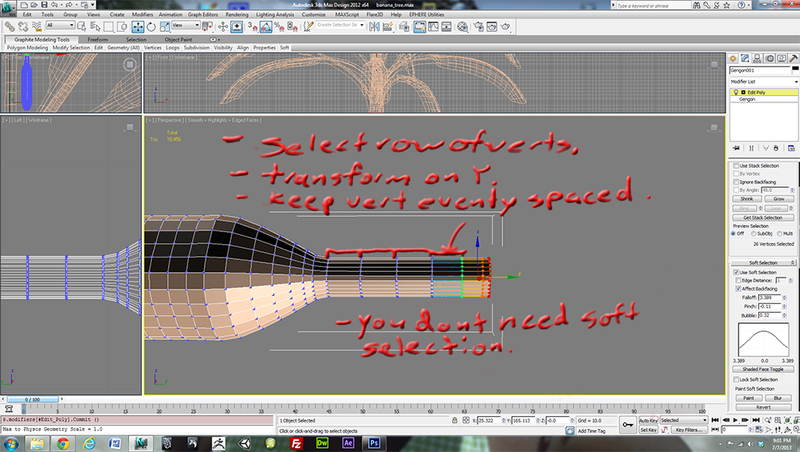 Give it evenly spaced quads for mudbox. Step 31, rotate banana 90 degrees flat on the ground. Step 32, Add Edit Poly Modifier. 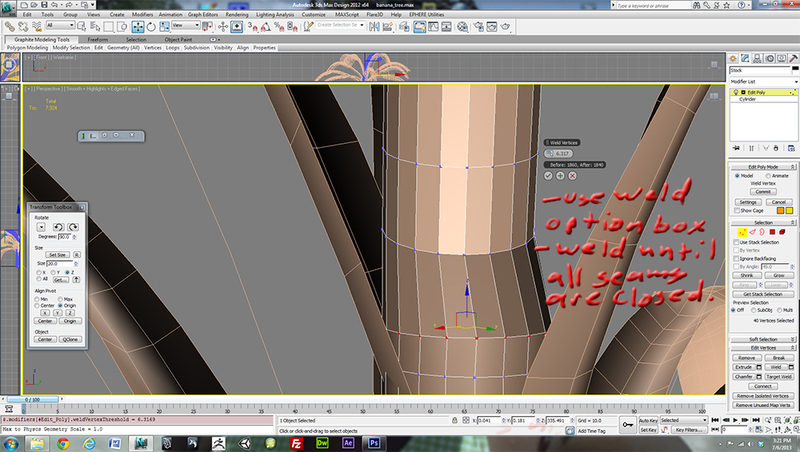 Select verts on the far end in the left view port. Turn on Soft Selection and affect falloff to about where it shows. 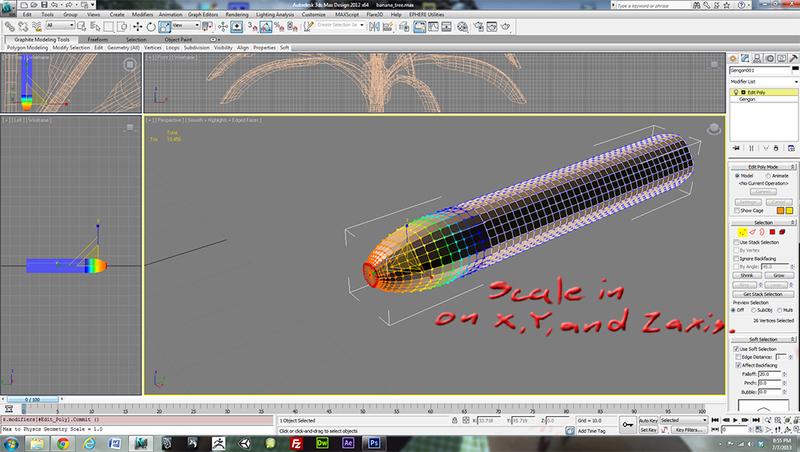 Step 33, Scale in on the X, Y, and Z axis. Step 34, Select about six rows of verts on the other side. Leave Soft Selection on. Scale on X, Y, and Z to create a stem. 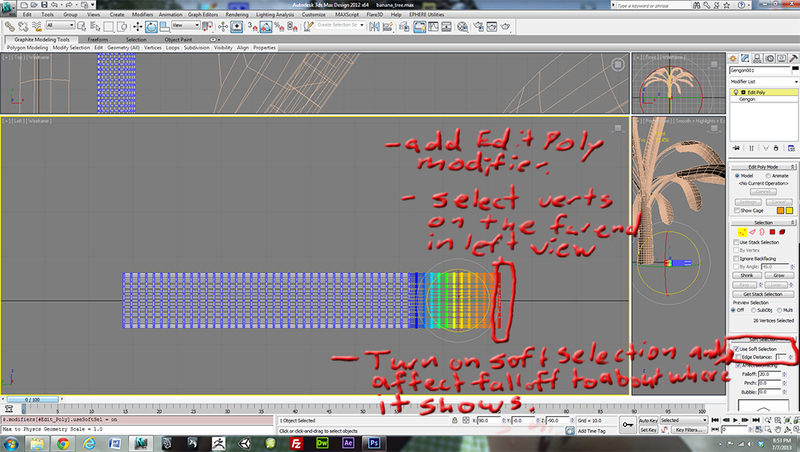 Step 35, select the row of verts shown. Transform on Y. Keep the verts evenly spaced. You dont need soft selection on. Step 36, select Edges in between gaps and connect. 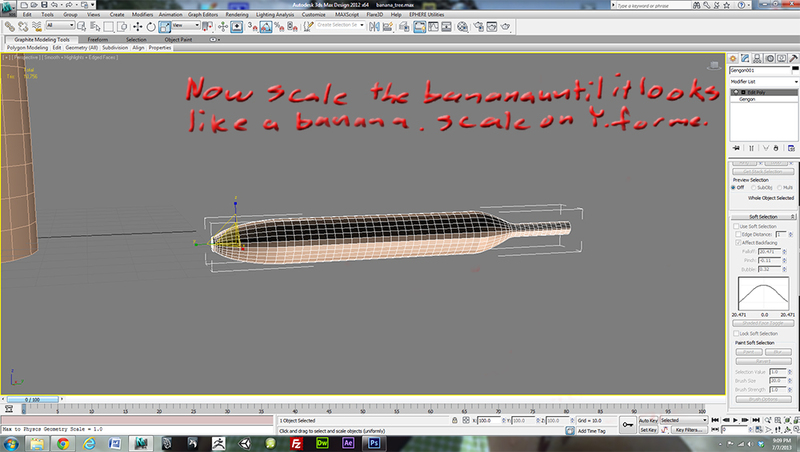 Step 37, now scale banana until it looks like a banana. Scale on Y. Stay Tuned. More to come. 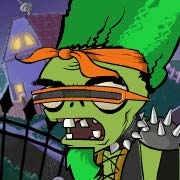 Also here is the animated gif. 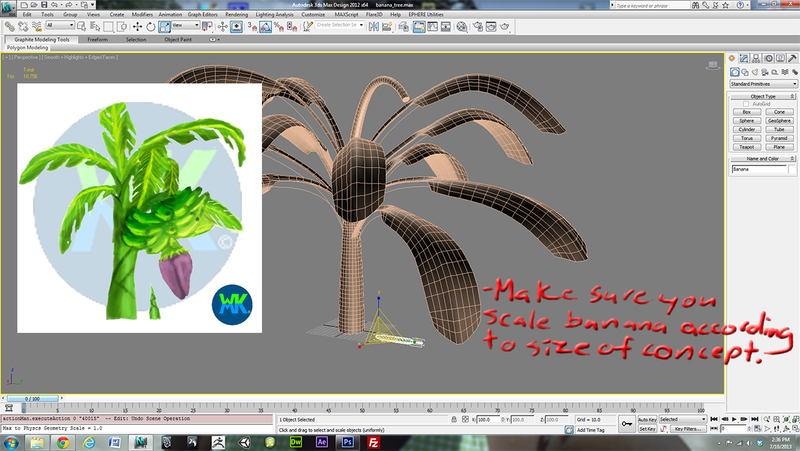 Make sure you scale banana to the size of concept. Gave material a standard gray material with the Material editor. 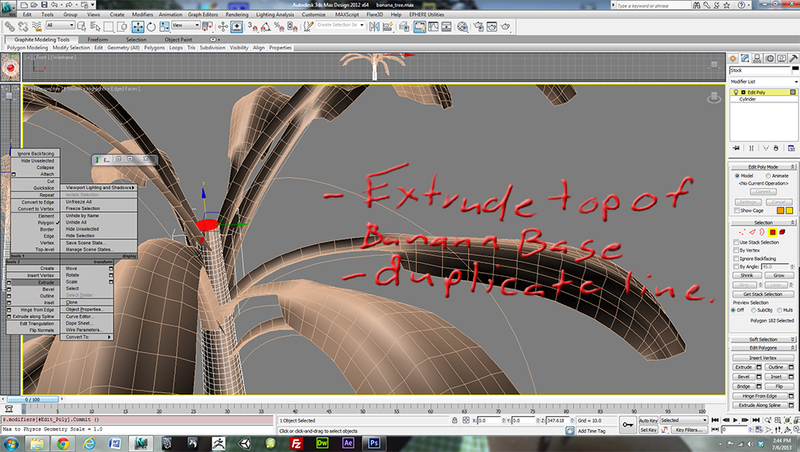 Made banana tree base on a separate layer. I grouped the leaves and the Tree Base and hid it. 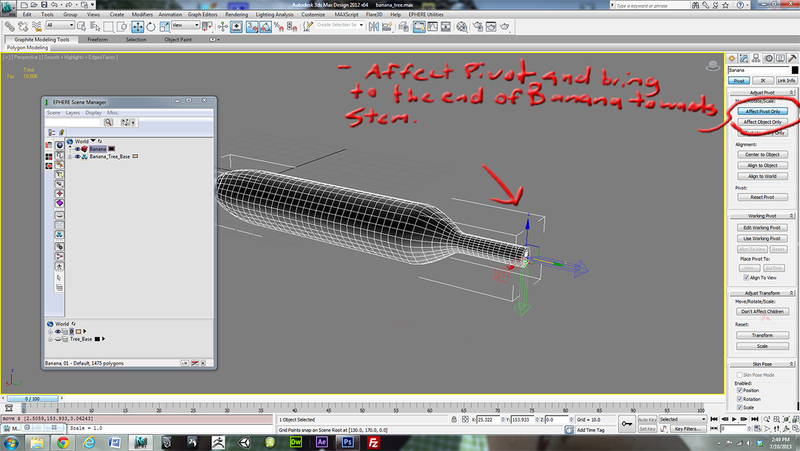 Affect Pivot and bring to the end of banana towards the stem. 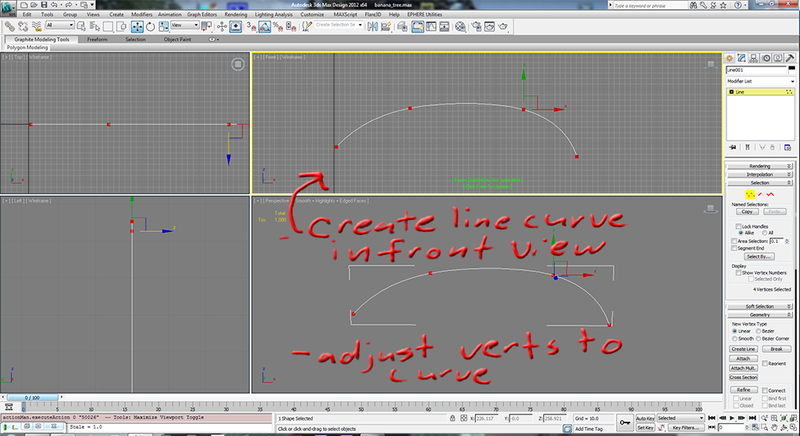 Step 41, Create a line that is curved like this one in the left view. Select Banana and choose the Path Deform WSM Modifier. Do the same thing we did with the banana leaves and pick path the line we made. 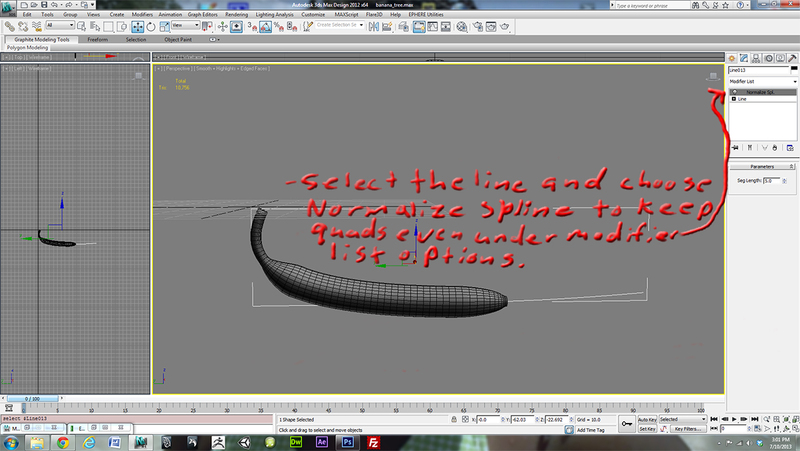 Select the Line and select the Normalize Spline Modifier to keep quads even under modifier list options. 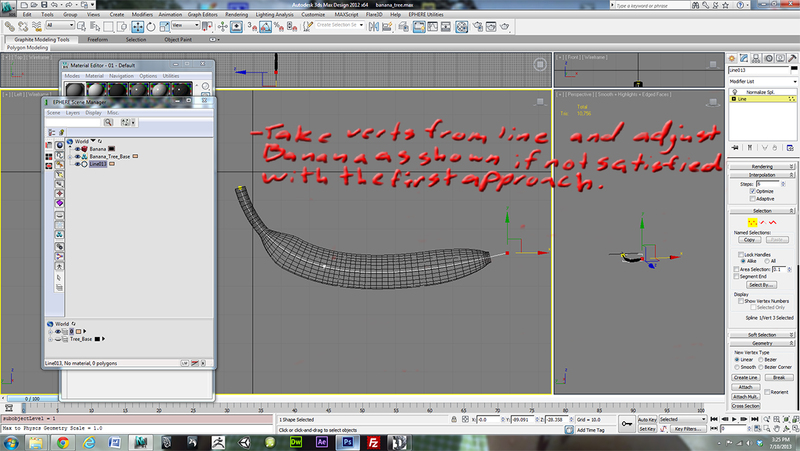 Take Verts from line and adjust banana as shown if not satisfied with the first approach. 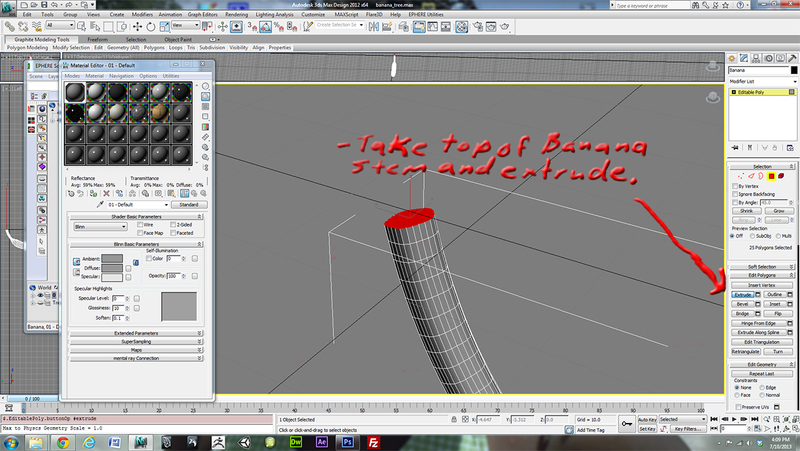 Take the top of the banana stem and extrude like shown in the next coming photos. Extrude and Scale Local to create a base for the stem.